Size: 1 to 2 feet. Growth Form: Forb/herb, subshrub; erect or ascending, multiple stems, fine pubescence. Leaves: Green; more or less alternate, short petioles, leaf shape lanceolate or linear lanceolate, leaves long, 4 to 8 inches, irregularly arranged in 3’s, folded along midrib. Flower Color: Greenish-yellow with maroon; flower clusters 3 or more inches wide, terminal on branch, fruit is a seed pod called a follicle. 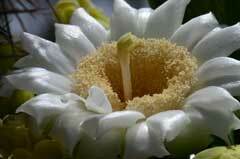 Flowering Season: April to August. Elevation: 3,000 to 9,000 feet. Habitat Preferences: Dry plains and slopes, openings in pine forests. Recorded Range: In the United States Antelope Horns Milkweed is found in the greater southwest part of the country and Idaho; AZ CA, CO, ID, KS, NE, NM, NV, OK, TX, UT and northern Mexico. North America & US County Distribution Map for Asclepias asperula. Asclepias asperula ssp. capricornu, Antelopehorns. Both subspecies found in AZ. 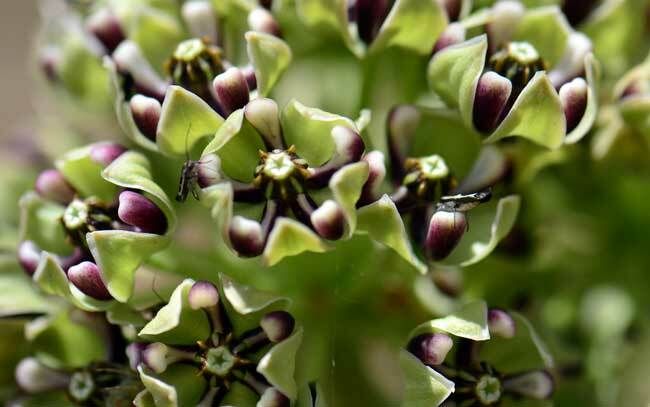 Comments: Antelope Horns Milkweed is an attractive plant with large and bold flowers often visited by bees, butterflies and other insects. 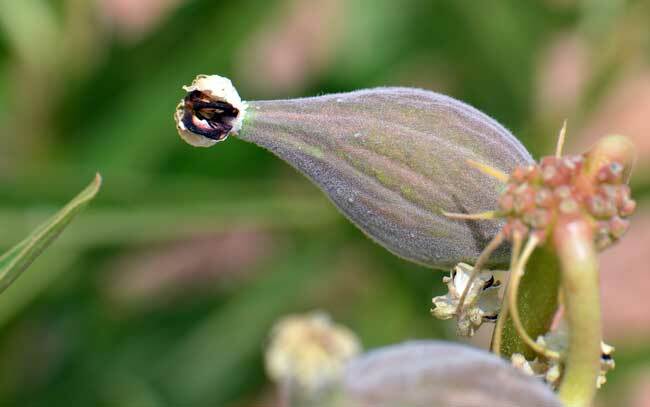 As is the case for many milkweeds, Antelope Horns Milkweed is a host plant for the Monarch and Queen Butterflies providing a great food source for their larvae caterpillars. The common name Antelope Horns is reflective of the maturing seed pods which begin to curve as they grow and soon resemble "antelope horns". Also see in Southwest Desert Flora; Arizona Milkweed, Asclepias angustifolia, Mexican Butterfly Weed, Asclepias curassavica, Dwarf Milkweed, Asclepias involucrata, Pineneedle Milkweed, Asclepias linaria, Rush Milkweed, Asclepias subulata and Horsetail Milkweed, Asclepias subverticillata. Asclepias capricornu ssp. asperula and Asclepias asperula ssp. asperula in the Supplement. 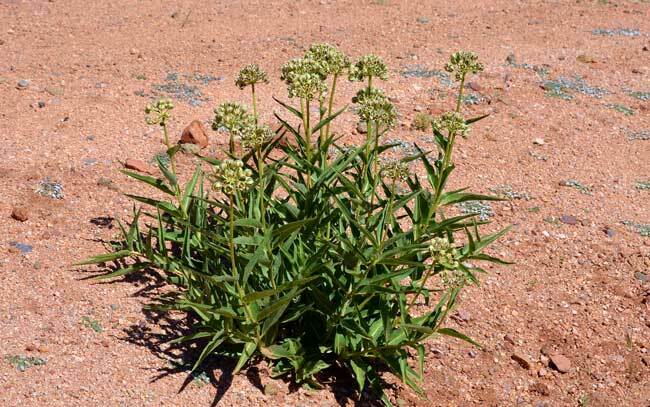 2002, The Jepson Desert Manual; vascular plants of southeastern California, Baldwin, Bruce G., et.al., University of California Press, Berkley and Los Angeles, California, as Asclepias asperula, subspecies asperula. Native Plant Information Network, NPIN (2013). Published on the Internet http://www.wildflower.org/plants/ [accessed: 1/17/2015]. Lady Bird Johnson Wildflower Center at The University of Texas, Austin, TX. 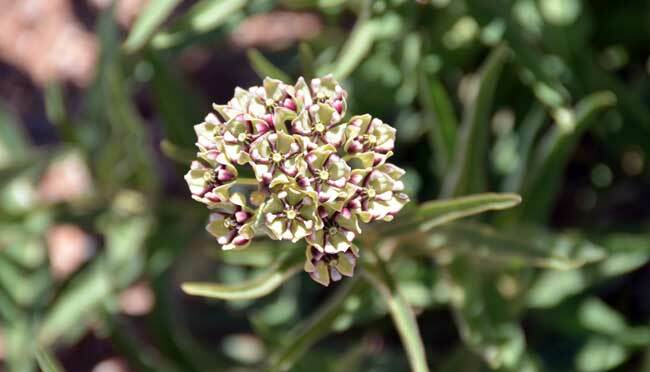 1993, The Jepson Manual, Citation: ttp://ucjeps.berkeley.edu/interchange/I_treat_indexes.html (accessed 1/17/2015), as Asclepias asperula, subspecies asperula.